“And now, a close up shot of the curry paste because I’m a food blogger.” This made me laugh SO HARD! I always take artsy ingredient shots and I’m like “do readers care about this pomegranate or whatever?” Love it! Thai curry is completely my life. I just made red curry and green curry last week…Obviously yellow curry is missing. AND YOU MADE THE PASTE. I misread that and I thought you said GOAT curry. I was like, uhhh, wow, bold! 😉 Thanks Taylor! hubby had some goat soup recently on vaca in Bonaire and loved it. Bought a 2nd bowl! My husband has a serious “meat tooth”. He likes his beef! So I love this awesome Thai recipe because it’s so beefy (for him) and potato-ee (for me) Meat for him. Carbs for me. Yippee Skippee. And you know what? It doesn’t bother me that this recipe might take a little time (and for me practice) because good curry sauce is worth it. And I’ve learned that the best things in life do require a little extra time & effort. Wishing you many blessing today! I have to admit this is pretty impressive! Ooooh, this looks amazing!! Love the sound of that curry paste. YUM! Big curry fan over here! This looks delicious!! I’ve been meaning to make my own curry paste! Love this. I love Thai curries so I make my curry paste in big batches from scratch and then freeze them in 2 tbsp blobs in a silicon muffin tin and then transfer to freezer bags for storage. That way I have homemade paste ready when I need it without the work. 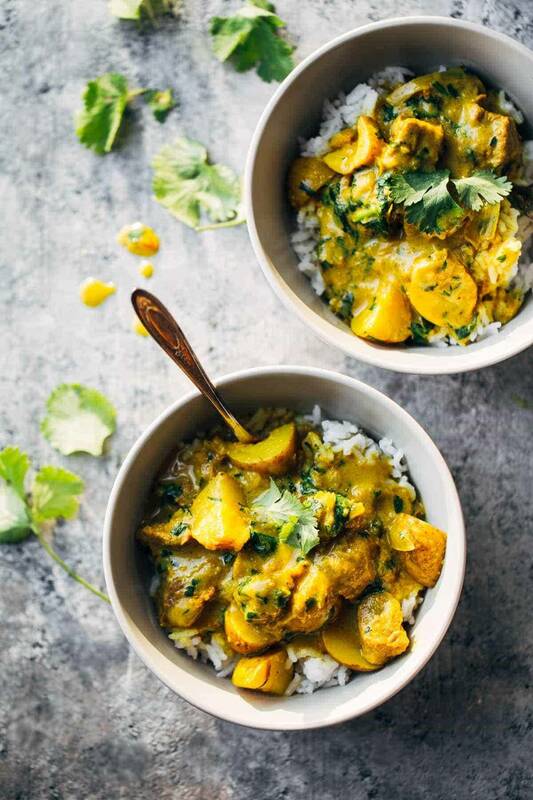 This recipe looks great, I make yellow curry with chicken and potatoes all the time and it is super yummy comfort food. Can’t wait to try this version! Hello! 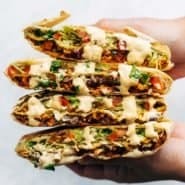 I saw this recipe and it looks awesome. I love making new things from scratch. I am a chicken person, not a beef, so I was contemplating substituting chicken in this recipe. After reading your comment, can you share your chicken version? Thai food and beef? I’ll have several portions please! I’m far too lazy to find fresh galangal, but I have seen galangal puree at the supermarket. Oh my gosh, seriously? I would love to get my hands on some of that. Is it the Garden Gourmet stuff? Thank you for having me salivate in front of my laptop! We usually buy yellow curry sauce at Trader Joe’s, but I’m sure making it from scratch would taste even better. I love making my own curry pastes… you only have to do it every once in a while (in a big batch!) and then I usually freeze the leftovers in an ice cube tray so I have little pieces ready to go to toss into whatever I’m making. I would totally make this any day of the week! Can’t wait to give it a go. Love that! Ours is just in the jar in the freezer right now but I read about the ice cube trick and I must try! I believe it. I had to avert my eyes and plug my nose as I put it into the blender. It grosses me out A LOT, but it made for an awesome curry! 🙂 Kind of like fish sauce – always delicious, but never ever smell it. Most authentic curries that I have made require time (read love) to make well and are absolutely worth the effort. This is definitely a weekend project but I’m adding it to my list of things to make this month. One question, in step one it states to put the shallots and garlic in a foil pouch, and then in the second foil pouch to put the ginger and garlic. Did you mean ginger and galangal in the second pouch? I’m thinking you did but I’m not completely sure so I’m asking for clarification. Thanks for another great recipe! Yes I did! So thankful for all you readers who catch that stuff – thank you! I posted a curry recipe today too! Not all-homemade-everything though – super impressive! That thick yellow sauce looks toooooo die for, and totally worth the wait. 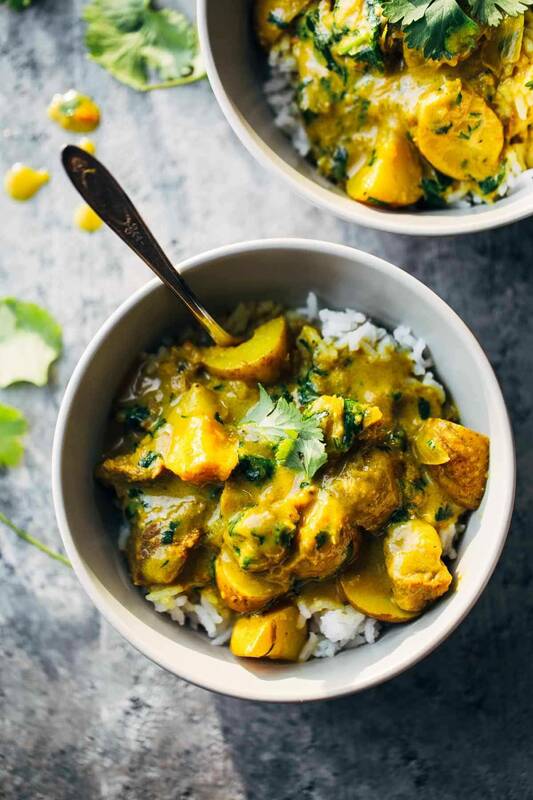 I’m not sure whether to be frightened or excited by this… yellow curry might be the single most delicious food on the planet, but I never even considered making my own curry paste! This might make me feel like a goddess… a goddess with yellow curry!! I’m looking forward to trying this! I bought the Best Ever Indian Cookbook back in December (have you read it? if not, you should. everything = delish) and have slowly started working through it – I’m starting to love love cooking Indian and am excited to add this one to the list! OH MY GOSH, yes! Is it that really old school one? I have had it for years and it’s one of my favorites! Complicated recipes like this are definitely worth the time and work now and then. I find something immensely satisfying about taking my time in the kitchen, letting ingredients come together, and then watching others enjoy the fruit of my efforts. 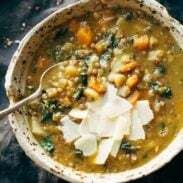 Thanks for sharing this lovely recipe! LOVE that this is from scratch! The extra effort is SO worth it sometimes – looks amazing! This looks absolutely amazing! WOW!!! Thank you for posting this so quickly, Lindsay! I definitely want to make it because I love anything Thai. I’ll have to temper the heat for my husband, even though I know that real Thai food is impossibly hot (spent 7 weeks in Bangkok back a few years, and experienced that first hand). When I was a lot younger I did a lot of Chinese cooking, always experimenting, so the work for this recipe does not intimidate me. I’m hoping that my local Asian grocery has galangal – Asian ingredients, even at our Asian grocery stores, are not always easy to find, living on the border with Mexico – and that I can get the dried Thai chilies. With this recipe I am suddenly really missing the incredible Asian grocery we had back in Richmond, VA (that’s the only thing I miss, though). I’m really looking forward to making this, and can guarantee that I’ll eat the whole thing if my husband doesn’t like it. I’ll happily make him something else. Oh my, the second time I made this our mouths were ON FIRE. Make sure to get the coconut cream and not just coconut milk – I think that’s why it was so hot the second time was because I swapped the milk for the cream. Did the coconut cream make the overall dish taste too sweet for your liking? Just wondering. I’m trying to decide if I want to sub the milk for it and decrease the paste so it’s not spicy or just make it how you first made it with the cream. Okay, are you SURE this calls for TWENTY Thai peppers??? We must be thinking of different Thai peppers because the kind I get from my Thai friend who grows them in her garden would kill someone if they used 20 for a recipe. Just make sure you use only ½ cup of the paste when you make the dish or it might be too hot (I used the ¾ cup). Susan, I plan on making this tonight. Can’t wait! Haha – yes, they are dried, tiny, little red ones. They called them “thai chile peppers” at the Asian market I went to. The long from scratch recipes have merit and an audience! So don’t discard doing more of them 🙂 I made the red lentil curry recipe last night with yellow curry paste from the supermarket. It still has a little kick but not much, I think I prefer the red paste for the lentil recipe. You could always use store bought minced garlic and ginger to skip a step! I recently discovered your blog and I’m in a world of wonder, thank you so much! I’m from Europe and not always clear on what amounts you buy ingredients in but I’m a little confused about the ingredients list vs the terminology in the recipe. It says cups of coconut milk and cups of coconut cream in the list, but in the recipe itself there’s only mention of cans of coconut milk. How many cups is a can? And when does the cream come in? Sorry for the bother but thanks a lot for the help! I look forward to making this over the weekend. I’ll get that fixed up now! Thanks Aere! Thank you Senika! I will update the recipe to clarify. Thank you for this post–I’m glad that you decided to share it despite your reservations. About six years ago, I moved to a place where there are no Thai restaurants, and of course there is no Asian grocery. It took months and months of reading and experimenting with different recipes and substitutions before anything I made with the ingredients available here turned out well. But now, though I haven’t yet shared it, finally I have a good recipe for a green Thai curry. I can’t wait to branch out and try this yellow paste–I actually enjoy setting aside time to make curry! Oh my gosh, when you get your green curry post up, please email it to me! I have been looking for a green curry recipe.